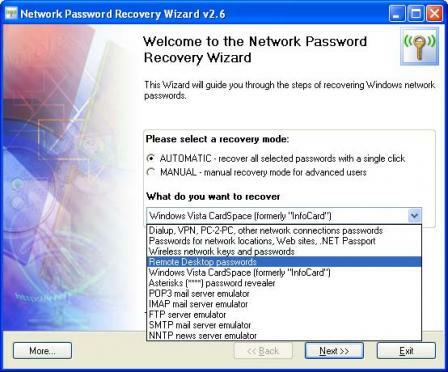 Windows network passwords recovery utility. NPRW can recover the following types of passwords: dialup (RAS), vpn, direct pc, LAN and Internet Explorer passwords for protected Web sites, .NET Passport accounts, other passwords stored by Windows Credential Manager, domain cached credentials, passwords for wireless network, remote desktop, CardSpace/InfoCard PIN, asterisk passwords, mail/news/ftp passwords, etc. The program can operate automatically (not requiring any special knowledge) and manually (great for recovering sensitive information from old accounts).